Today we will take you behind the scenes once more. Actually we will even take you to the flight deck in this post. 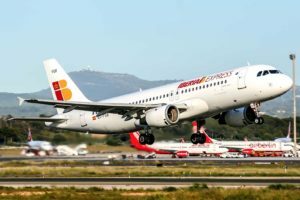 We have found a pilot that was actually flying our Iberia Airbus A320 – the EC-FGR – and have asked him for an interview. 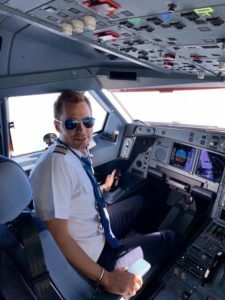 My name is David, I am 35 and I am currently an A330 instructor in one of the biggest airlines in southwest Asia. Did you always want to become a pilot? Yeah, I know it’s the typical answer, but I always dreamt of being a pilot – but I swear it’s true! I never thought of a plan B in case it didn’t work… fortunately it did. Also, in my family there are no more pilots, I am the only one so far. I started my flying carrer in Madrid, I have flown the A320 in Spain before I moved to Asia to fly the A320 at first and then the A330. What was it like flying our Iberia A320 EC-FGR? I can’t recall flying specifically the FGR, since I joined many years after its delivery in 1991, however I remember that this plane together with her “batchmates” (also known as the A1 variant), had a few pressurization issues shortly after they were recovered from storage and sent to Iberia Express. This was, together with the fleet renovation program a reason why this planes where finally signed off, however the reliability of the A320 made them fly for more than 20 years covering millions of kilometres all around Europe and Africa. How does the A320 compare to the A330 that you are flying today? The A330 is a “big” version of the A320. Cockpit wise is 90% identical, few systems change such as the hydraulic system and others adapted to the type of operations carried out by a narrow body, aside of that everything is pretty much the same. What is it like flying in Asia as opposed to Europe? Flying in Asia is not much different than flying in Europe, of course there is a slight cultural factor compared to flying in your own country and speaking your mother language, but nothing that will prevent you from having fun while doing your job! Flying wise there are very interesting airports that you most likely won’t experience flying in Europe, such as Hong Kong, Beijing, Sydney but this also applies the other way around such as the Canary Islands in Spain or the UK! You mentioned the cultural factor. Is it different with more Asians on board than Europeans? Asian passengers are very different than European pax. Most of them are traveling for work and not for vacation, so they are more quiet and barely buy nothing on board compared to European passengers. I remember in Europe for certain summer destination we had to double the quantity of catering yet everything was sold! On the other hand Asian passengers – and this is a personal opinion – are more thankful, especially Japanese passengers. But the same applies to Japanese Ground personnel servicing the plane or even ATC, they always try to say some words in your language. What was the most exciting airports you ever flew in to? I like flying a lot to Seoul and Tokyo. In winter time they become challenging airports, the winds are strong and in Seoul it is easy to have a foggy day, where special procedures for landing and departure are enforced.Sydney is a very, very crowded airport, so there is no room for mistakes either. I also love the new airport in Qatar, the terminal is fantastic. Yes! Flying so many passengers leaves you with a lot of funny, not so funny and weird situations! I have seen a proposal in my flights for example. The passenger coordinated with the airline and we got advised that this could happen so the crew was prepared. Also, I had a passenger that passed all the “safety barriers” and got in the plane with a ticket to another destination, he didn’t find out until we landed! Another nice story is that a pregnant lady gave birth on board! Glad we had a few doctors on board and some nurses as well so everything went well. On the sad part of the story, I also had a couple of medical emergencies where we had to divert. However as far as we know the passengers were stabilized and recovered. 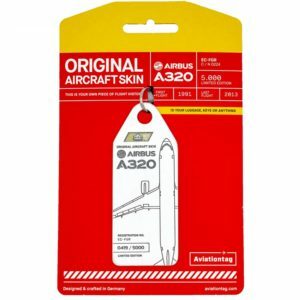 Posted in Background and tagged a320, airbus, aircraft, aviationtag, iberia.